One clachan, Peatfold, where now there is only a single croft, there were, in the middle of the last century (1800’s) five shoe makers and two tailors., while now the one shoemaker in the whole Glen has to supplement his shoemaking with the duties of post-runner. Peatfold is no longer a working farmsteading; the cottage is rented out as a private residence, the range, which originally contained the byre, is now used as a store, and the walls of the threshing barn have been reduced in height. The cottage is a simple one-and-a-half storey structure with a central entrance and flanking windows on the SE, where there is an adjacent garden. The former byre and the barn stand immediately N and NE of the cottage respectively. The barn has been a split-level building, set on the E-facing slope, with the floor at the W end being the higher. The walls of the barn were reduced to about 1.5m in height when it was converted to a kennel some years ago. The wheel that powered the threshing machine is no longer visible, but it would have been set towards the E end of the N side, driven by water supplied from a pond 120m to the N via a covered lade that runs along the W bank of the Burn of Peatfold. In addition to the cottage, byre and barn, the 1st edition of the OS 6-inch map (Aberdeenshire 1869, sheet L) depicts two other roofed structures, but of these there are now no traces. The first was situated immediately W of the byre but appears to have been removed by the end of the 19th century and is not shown on the 2nd edition of the map (1903, sheet L), while the second, which was still roofed in 1903, lay to the S of the barn. 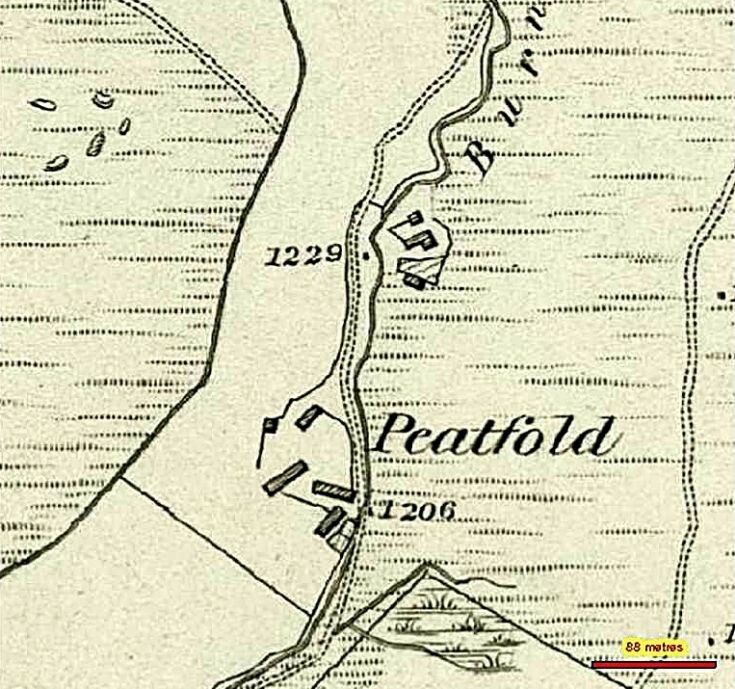 A roofed, L-shaped building shown on the 2nd edition of the map immediately S of the cottage has also been removed. Visited by RCAHMS (JRS), 15 May 1997. The ruins of this farmstead, which comprise the footings of at least five buildings and three enclosures, are situated upon low-lying ground immediately E of the Burn of Peatfold, about 120m N of Peatfold farmsteading (NJ31NE 56). The northernmost elements of the farmstead are two buildings set close to one another on opposite sides of a former track. To the E of the track is a two, possibly three-compartment building, measuring about 17m from NNE to SSW by 6.2m transversely over grass-grown wall-footings 0.6m in thickness and up to 0.3m in height; there are entrances on the W. To the W of the track the other building measures 8.1m from WNW to ESE by 4.2m internally and has an entrance on the SSW. Attached to the NNE side is an enclosure measuring about 10.4m from NNE to SSW by 9.6m transversely within a tumbled, rubble-built wall standing to a height of 0.5m. To the S and SE respectively of these buildings, there is a roughly rectangular yard, which contains a shallow, rectilinear depression; the depression measures 5m by 3m overall and up to 0.2m in depth and may represent the site of a robbed building. To the S of this yard there is a small enclosure measuring 10.1m from N to S by 6m internally. On the W side of the enclosure there are the crude stone footings of a structure that may originally have had a timber rather than stone superstructure, while to the S are the ruins of a stone building, possibly a sheephouse, measuring 9m from E to W by 4.1m transversely within walls up to 1.5m in height. A later sheep-dip has been inserted at the W end and a gap has been knocked through the gable. Adjacent to the enclosure, on the E, there is also a yard defined on the N by a dilapidated wall and on the E and S by low stony scarps. A short distance to the S of this yard there are the grass-grown footings of a rectangular building measuring 8.3m from E to W by 4m transversely overall. A possible entrance is visible in the S side. Other features within the vicinity of these buildings include: a trackway that passes to the W of the buildings, a branch of which enters the farmstead; a dam associated with Peatfold farmstead (NJ31NE 56); and the possible remains of a small rectangular structure, measuring 3m by 2m over grass-grown banks 0.15m in height, which is situated on a terrace on the W side of the burn to the N of the dam. The farmstead is depicted on the 1st edition of the OS 6-inch map (Aberdeenshire, sheet l, 1869), with three roofed structures, none of which can be certainly equated with those that have been described above. The 2nd edition of the map (sheet l, 1903) depicts two unroofed structures, one of which may represent the westerly of the two buildings at the N end of the farmstead and the other the structure lying on the W side of the small enclosure. Visited by RCAHMS (ATW; JRS), 15 May 1997. Thank you so much for this information, my Grandfather was Alexander Dow, who's family lived in the cottages, does any one have any images of the peatfold cottages.